The perfect small bounce house for toddlers! Our Toddler jumper is the perfect size for your smaller guests. With its low profile, this miniature castle can be setup indoors too! Adorned with vibrant pink, red, yellow, blue and teal hues, and four spires, one in each corner of the castle. Your little ones will feel like royalty. Kids can spend hours jumping, making friends and watching over their kingdom. 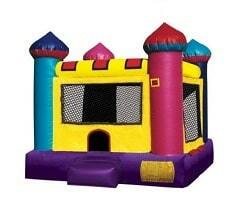 This Mini Castle jumper from San Diego Bouncers is perfect for any prince or princess party. Capacity: 1-5 participants, up to 60lbs. Max 300lbs. Minimum space: 12'L x 10'W x 10'H.